1 Heat about 1/4-1/2 inch of oil or shortening in a frying pan. 2 Beat eggs then combine with milk. 3 Dredge tenderized beef cutlets in flour, then egg-milk wash, then a second time in flour. 4 Place dredged cutlets into heated oil and fry until golden, about 10 minutes. 5 Turn steak over and cook for another 5 minutes or so until both sides are golden. 6 Remove to a plate lined with paper towels and allow to drain. 7 TIME TO MAKE THE GRAVY: Drain all but 1-2 tablespoons of drippings from the frying pan; leave all the cooked bits you can. 8 Combine flour and seasonings with milk, then pour into the pan with drippings and bits. 9 Continually stir/whisk the gravy over medium heat for 10-15 minutes, or until desired consistency. 10 Taste and add more salt or pepper if necessary. 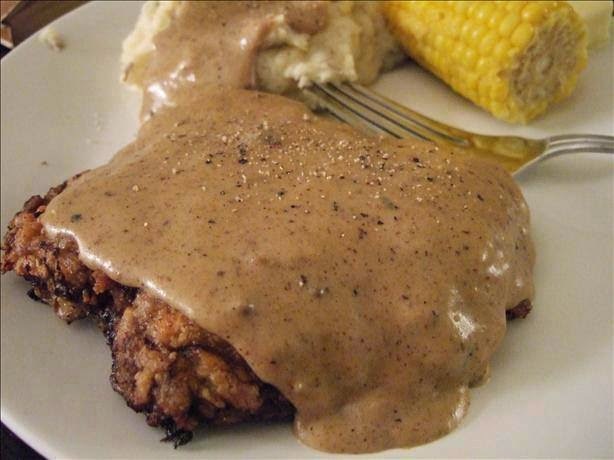 11 Serve generously over each piece of chicken fried steak. 12 Sop up any extra gravy with a biscuit.